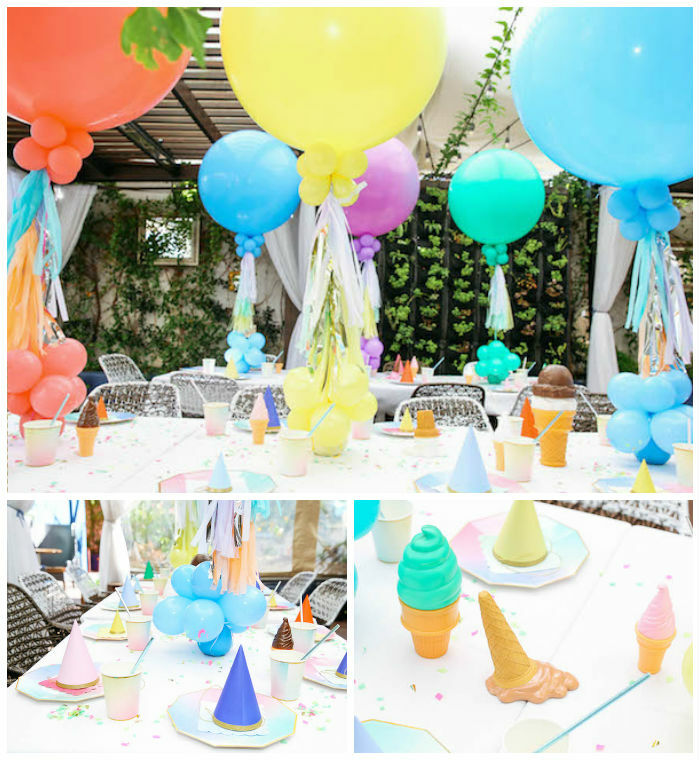 On the look out for darling ice cream party ideas?! 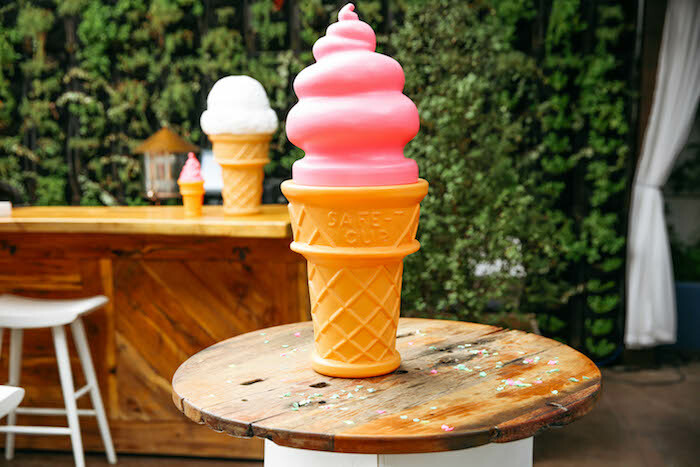 This Ice Cream Inspired Birthday Party, submitted by Ana Kha of Juju Zozo out of Los Angeles, California is “double-stacked” with elements and details you are sure to melt over! 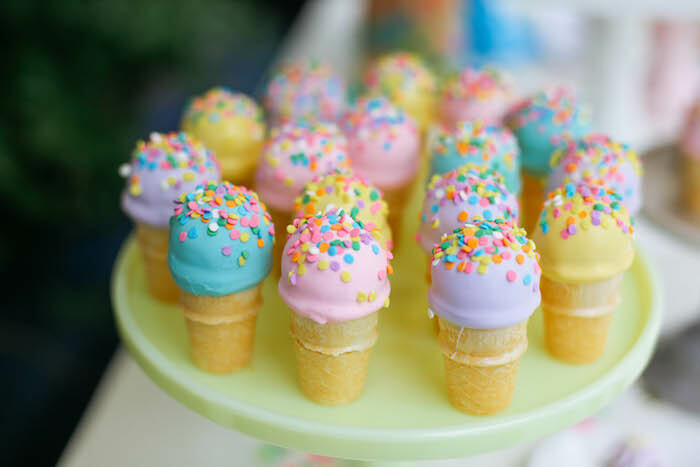 You know how it goes…I scream, you scream, we all scream for ice cream! 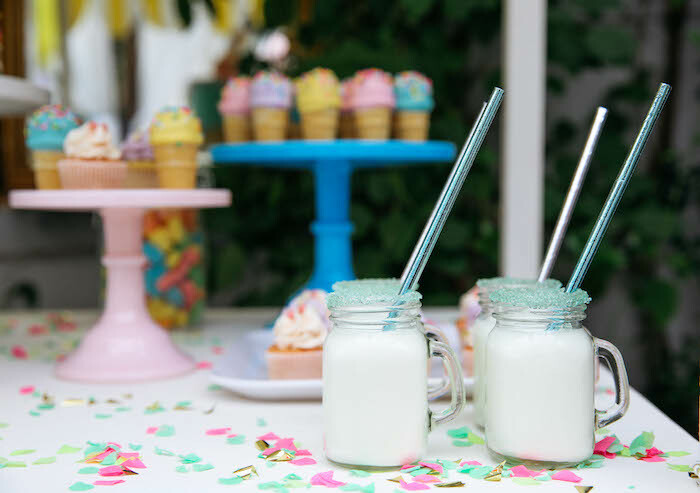 You’ll be inspired by the adorable, creamy and sweet party ideas inside this summer-loving, year-round party! This is what Ana said about planning the party- “Just a week ago our son “Juju” turned 3 years old. I literally can’t believe how quickly the time is passing by. 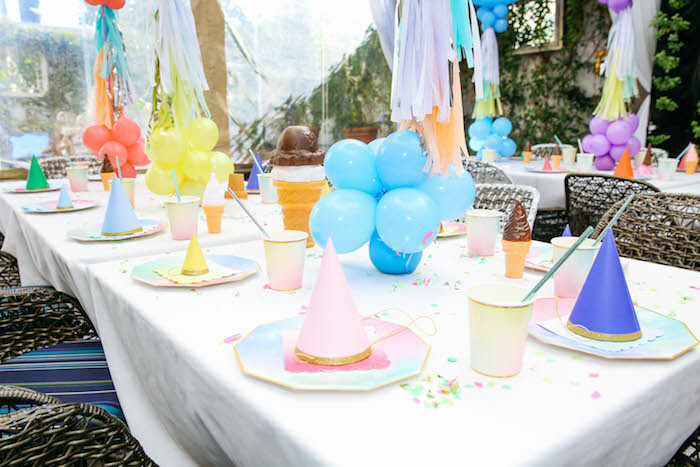 So a month in advance I started to prepare for his celebration, choosing a theme based on his favorite desert – ice cream! 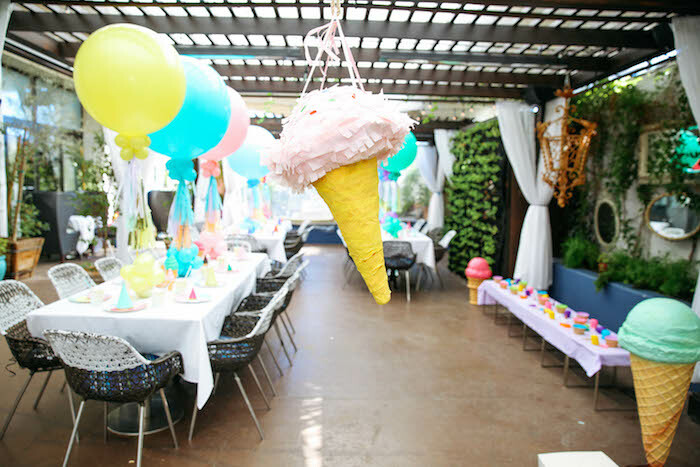 I found a pretty backyard at Sofitel Hotel restaurant and decided to make a brunch style birthday, bringing entertainment for kids. 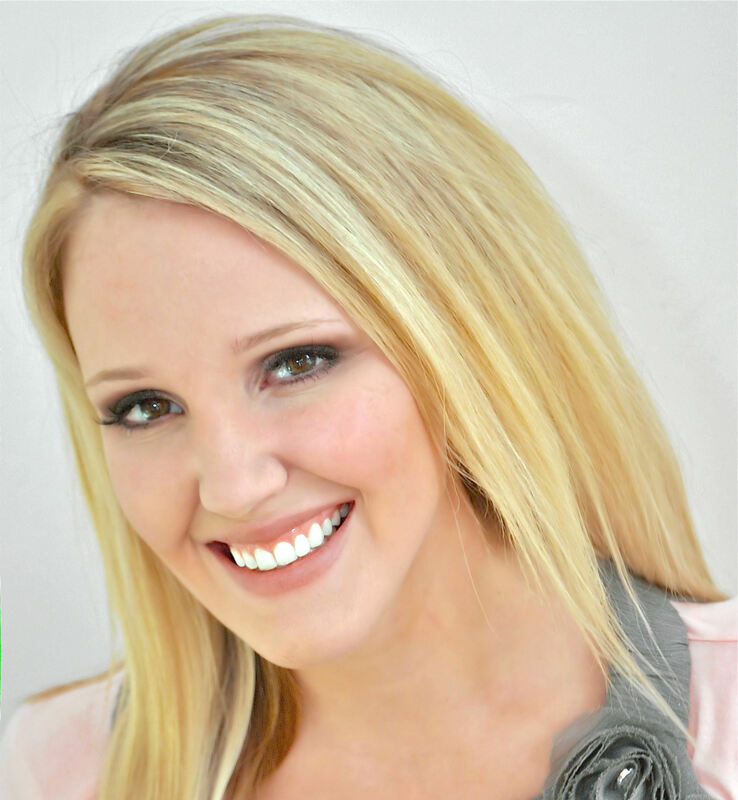 I hired Elza, Batman and Magician from Giggles Factory in LA to keep kids busy. And I thought of those kids who might have less interest in those characters by having a play duh station with ice cream bowls and utensils that I found on Amazon. They loved it! Perfect for the 3 year old age group of friends! 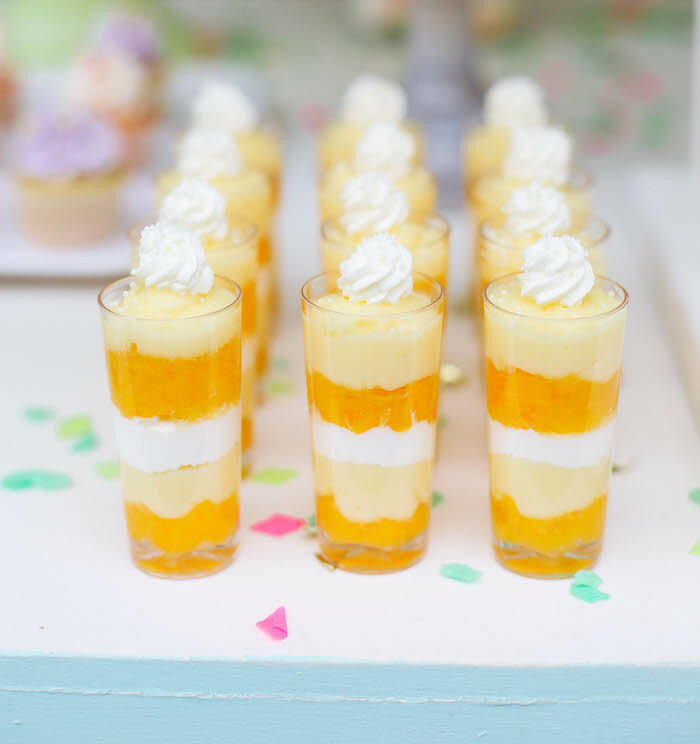 I always say to my friends, that the most important part of decoration of any party is having a beautiful and delicious desert stand! 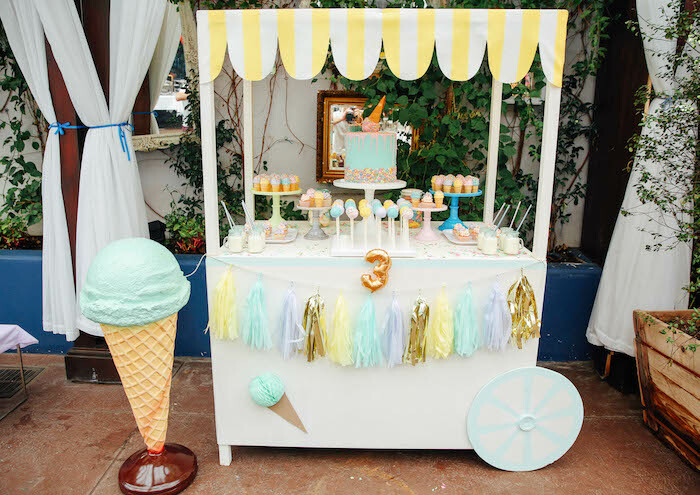 After going through some ice cream stand rental companies, I couldn’t find what i had in my mind, so to keep things in a budget, I asked my handy friend to get supply from home depot, and based on my sketch, my ice cream desert cart came to live! I went to the fabric market in Downtown LA, and found a perfect fabric for the roof for $8, that was a great addition! 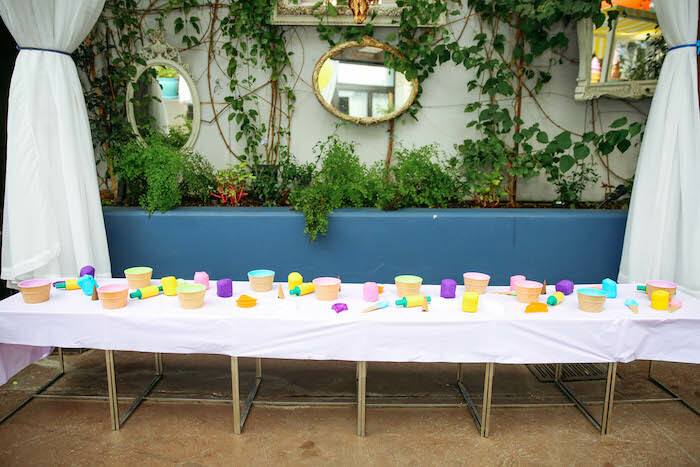 I am also quite a collector of cake and desert stands, so it was easy task to fill them with all these beautiful and freshly baked deserts from Baby Beas LA ! 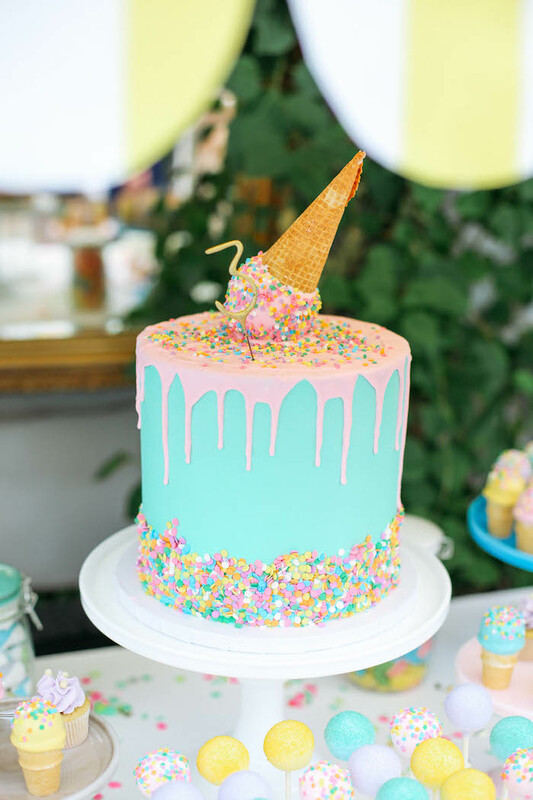 Main cake was turquise color with pastel color mix confetti on the bottom, and had this waffle ice cream shape cake on top with pink color cream dripping ( like if it would a real ice cream melt). 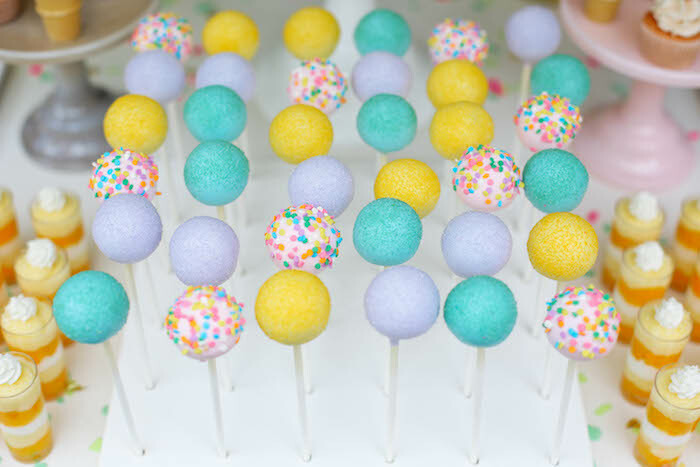 I love cake pops, kids love them, they are easy to eat, and look gorgeous on the desert table. So I found this stand from Etsy , BZBuilds that fitted all 36 mix color cake pops! 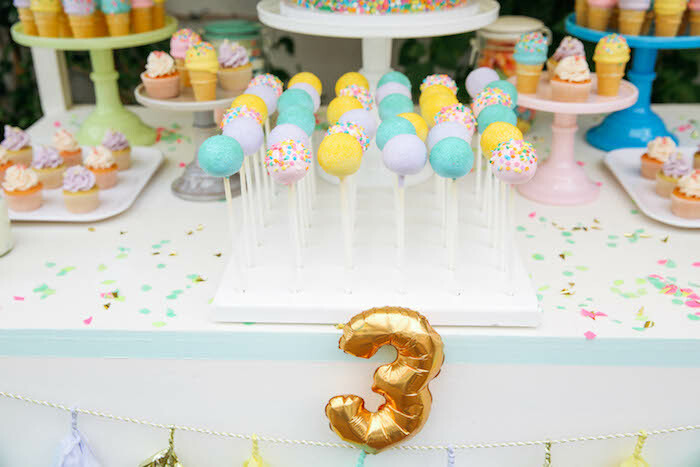 I ordered tassel garland from my favorite Easy store of Homemadexojules, and attached it to a stand for a festive look, and I attached a honeycomb ball and cut a waffle shape from a sheet of paper and attached with stickers to a stand to make it look like an ice cream. 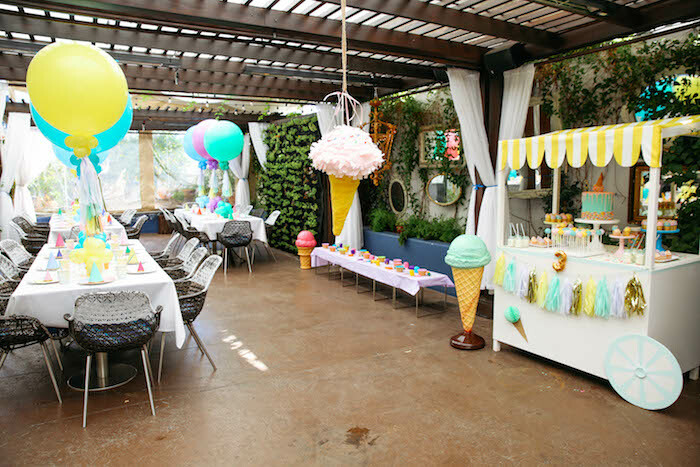 Throughout the space I had fun ice cream props , that I rented from Chakoda Design in LA. Another main area for decor is dining tables. 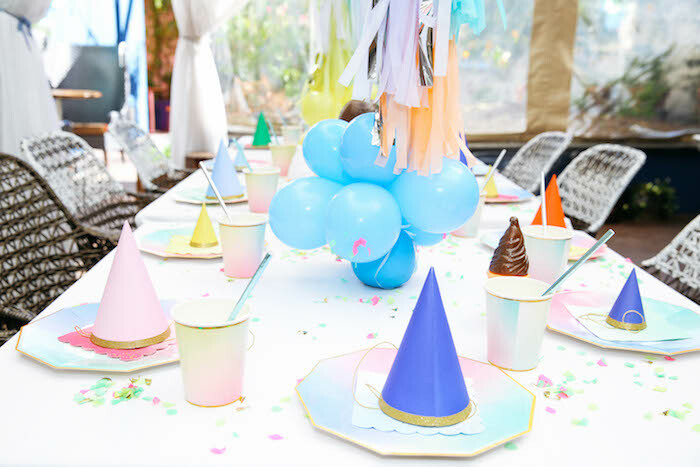 I had confetti spread around, gorgeous paper plates, cups, party hats, and straws from Meri Meri brand. 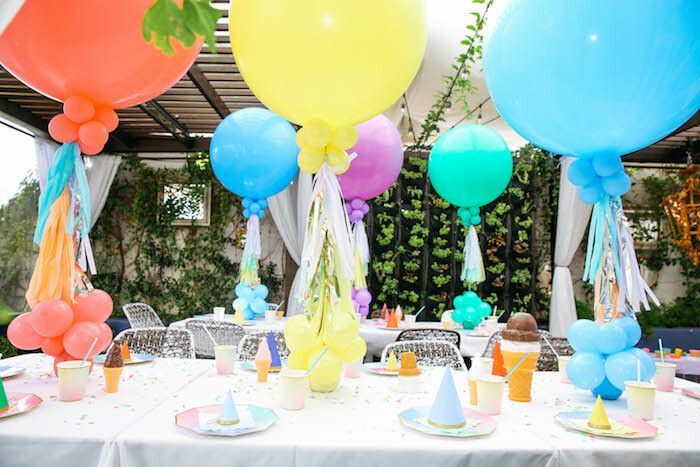 The main accent were these gorgeous 3 helium filled balloons from Balloon Celebration in LA, that i decorated with custom made tassels from Homemadexojules from Easy store. Everyone had the best time: adults and kids! On their way out, kids picked up the gift that I wrapped myself, it was a book about Sharing an Ice Cream by Mo Willems. 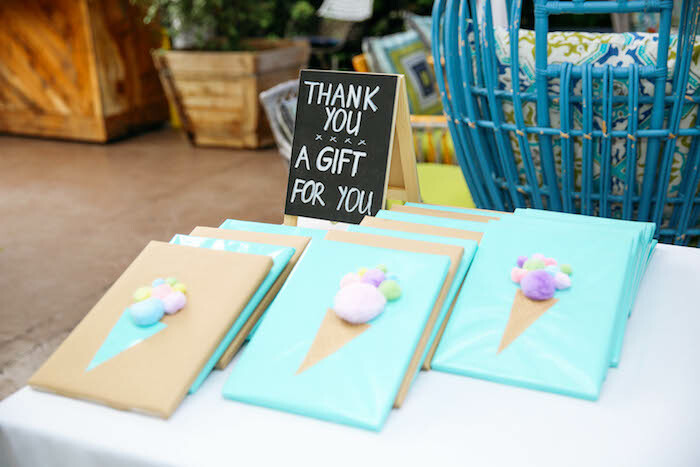 I used a turquoise color wrapping paper and used a hot glue to attach those soft balls, and regular glue to stick the waffle shape paper. It was a party to remember!!!! 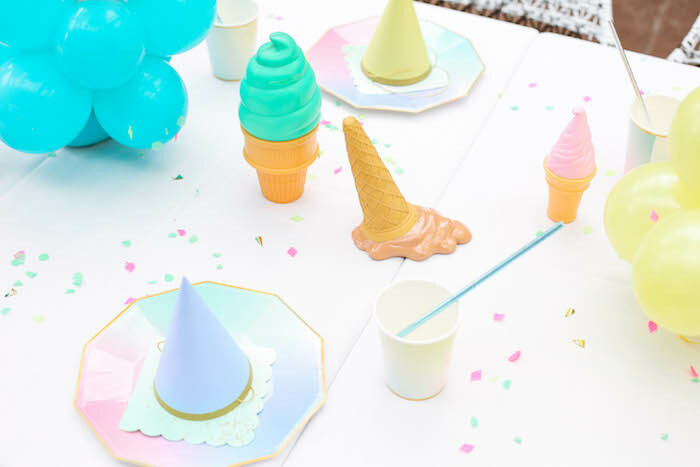 I absolutely adore all of the party styling at this cute ice cream party. So inspiring! 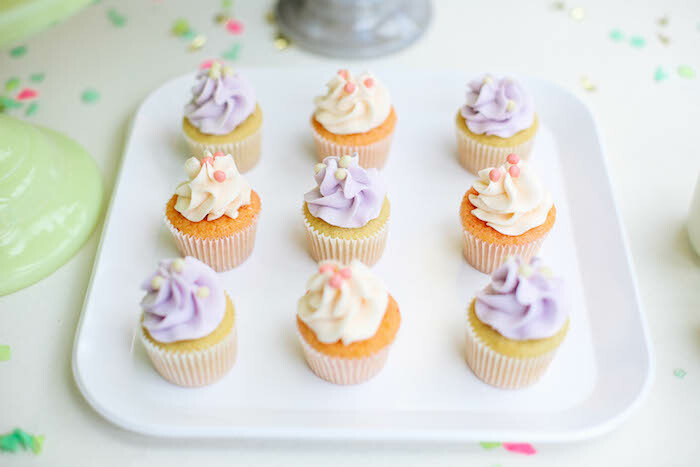 I’m planning a party with an ice cream theme, and included a link to this post (in particular, the beautiful cake) in my round-up of 5 must-haves for an amazing ice cream party (http://flickerandflock.com/ice-cream-party-ideas/). Thank you for sharing!! What’s the name of the main color of the cake, am a little confused lol is it mint Blue, Mint Green or a light turquoise ?!? !